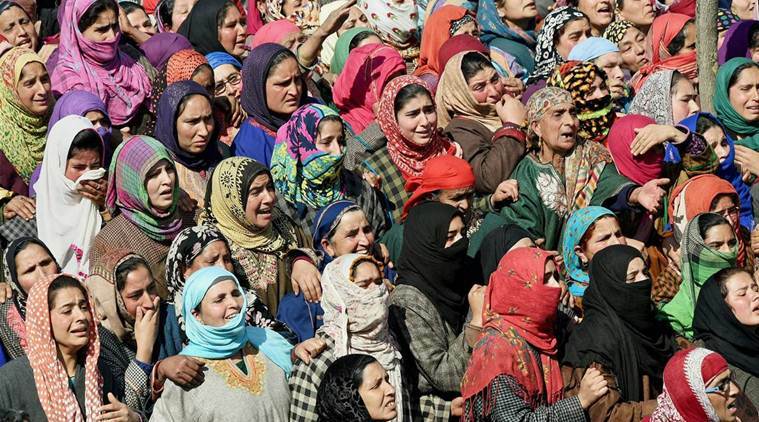 Thousands of people joined the funeral service of Lance Naik Mohiuddin Rather at a mosque in Punchpora village in Anantnag district of south Kashmir on Friday; a sight rarely witnessed in chronicles of the Valley's troubled past. 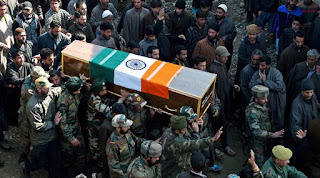 Mohiuddin, 35, and two of his mates were killed in a militant ambush at Mulu Chitragam in Shopian district on Thursday when they were returning from an anti-terror operation near Kungnoo village. Two other officers were also wounded in the attack. When the tricolour draped body of Mohiuddin was brought in an Army vehicle to be handed over to his family members for the last rites, thousands of residents of Punchpora village poured out of their homes in a spontaneous gesture to pay their respects to the dead soldier and console the bereaved family . Many even came from other villages for the nimaz-ijanazah (last prayers), which took place in the presence of top Rashtriya Rifles officers. A group of women were seen consoling his young weeping wife, Shahzada Akhtar, 26, and the soldier's unwell mother. 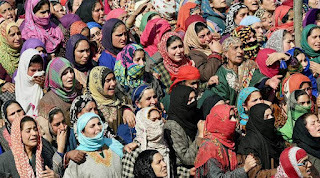 Women from the nearby villages walked to the slain soldier's village Punchpora, and were seen offering water to the young widow. As colleagues bid farewell to Mohiuddin, giving him a gun salute, many villagers couldn't control their tears. The turnout astonished some seasoned Kashmir ob servers considering that south Kashmir villages are known to be militant hotbeds.